I have been working on fantasy sword & sorcerer games pretty much for 12 years. Not by choice, but that's what the companies that I had worked for wanted to make. Finally now that I'm at Conduit Labs, I'm working on something other than dungeons. There was a brief moment a few years back I almost had a chance to work on a Sci Fi title. 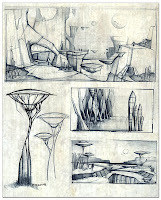 This is an old sketch of a couple alien environments. Many of the shapes of the plants pull from pod-like shapes or succulent plants. These are just simple form studies, and like with many of my sketches, I focus on trying to create interesting silhouettes through positive and negative shapes. Texture and color can come later once I have a better idea where these plants will be located.